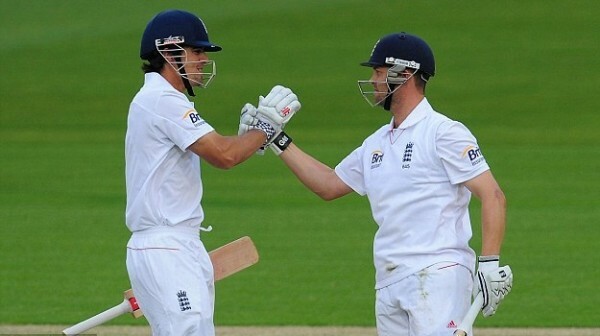 The England captain, Alastair Cook, assisted his team with a decisive lead of 193 runs while being involved in three partnerships well assisted by Jonathan Trott. India scored 316 runs in their first innings and England amassed 509 runs in 163 overs for the loss of six wickets. The third day’s play came to an end on Friday, December 7, 2012, at Eden Gardens, Kolkata. Earlier, England started off at 1-216 after utilising 73 overs while Alastair Cook and Jonathan Trott were unbeaten at 136 and 21 runs respectively. The Indian Bowlers made a nice beginning of the day by giving away just 11 runs off the first 10 overs. Cook hit the first boundary in the 84th over and Trott joined him four overs later. The latter reached his 13th Test fifty in the 91st over with a couple of fours as Cook was dropped by Ishant Sharma off his own bowling on the last ball of the 94th over at 156 runs. The visitors reached the 300 runs mark in the 109th over when Cook hit a four on the first delivery and he dispatched the first six of the day six over later. The second wicket solid partnership contributed 173 runs and enhanced the score to 338 when Jonathan Trott was caught behind by MS Dhoni off Pragyan Ojha for 87 from 223 balls with 10 fours. 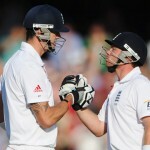 Kevin Pietersen joined in next with Cook who was batting excellently at the other end. 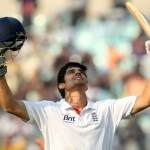 The pair added 21 runs to the total when Alastair Cook was unluckily run out for 190 off 377 with 2 sixes and 23 fours. Virat Kohli threw the ball directly on to the stumps, Cook jumped to avoid the throw and found his bat in the air resulting in the first ever run out in his entire Test career. England reached 376 in 135 overs for the loss of just three wickets at tea interval whereas Pietersen and Ian Bell were occupying the wicket with 24 and 3 runs accordingly. The boundaries started sprinkling from the willow of Pietersen at regular intervals after the tea break as he hit three consecutive fours off Ojha in the first over . Ian Bell once again failed with the bat and was caught behind by Dhoni off Ishant Sharma for five mere runs as Samit Patel replaced him next. Kevin Pietersen attained his 28th Test half century in the 143 over but was declared leg before wicket off Ravichandran Ashwin for 54 off 85 with 1 six and 6 fours in the next over. next, Matt Prior got together with Patel who started playing his shots and tried to send the ball out of the rope frequently. Patel hit two fours on the first three balls off Pragyan Ojha but Virender Sehwag held his juggling catch on the second attempt three balls later for 33 from 47 balls with 5 fours. The sixth wicket fell at 453 as Graeme Swann associated next with Prior and the duo kept the score board moving with regular boundaries. The fifth hundred of the innings was projected on the screen in the 161st over and the 50 runs partnership resulted in just 63 balls. England hammered 509 runs off 163 overs with four wickets in hand at stumps on day three. Matt Prior occupied his end with a determined 40 off 46 with 1 six and 6 fours as Graeme Swann was at the other end for 21 runs. Pragyan Ojha was the most successful bowler with three wickets whereas Ishant Sharma and Ravichandran Ashwin shared one wicket each. England is at the driving seat by gaining the first innings lead of 193 runs and another 50-75 runs will put them in a winning position. India has to remove the tail at the earliest to avoid a big lead and their batsmen have to perform well to save the match.